1. Introduction : The timing of an event in the life of a native is a challenging task for any astrologer, be it a novice or an expert. The westerners use a combination of results due to the major and minor progressions as modified by various aspects of planets. In Vedic Astrology, all practitioners employ only the Dasa and transit method. The efficacy of the Dasa system which is unique to Vedic Astrology has been proved beyond doubt over so many centuries of its practice. It is clear from the above table that the most widely used Dasha systems in Parashara School such as Vimshottari, Ashtottari, Kalachakra, yogini, etc are all based on the natal position of Moon. Moon, although not considered as a planet in Astronomy, has been rightly assigned a pride place in Vedic Astrology with the V.I.P status of a planet indicating the whole life events of a native. Now, some questions arise as to why only Moon is considered for the purpose and not other planets? What could be the unique influence of natal Moon to qualify for such a priority treatment? This article is the result of my efforts to find an answer to these questions. Disposition of mind, heart, Woman, good or bad, sleep, happiness, anything watery, travel, well, tank, mother, impartiality, consumption, salt, mind, ability, belly, nourishment, pleasure, splendor, quick in thought, fame, beauty, mendicant, middle world, life, middle age, eating, going to distant countries, Royal insignia, Good blood, vital energy, etc. These karakatwas of Moon (selected out of a lengthy list) bear a unique relationship with the physical existence of human life on Earth. Let us briefly examine some of these important aspects which render Moon as an unique planet singularly governing the whole life span of a native. i. Moon, the Universal Mother: Moon plays a vital role in the process of procreation of all living beings on Earth. Its lead role is not only procreation but also nourishing and aiding the growth of siblings as well as their sustenance till their last breadth is indisputable. Meaning : Mars and Moon are the cause for monthly menses. When Moon is in anupachaya rasis the menses for conception occurs. When the reverse is the case, and the masculine benefic aspects, the woman gets sexual union with man. (Translation by late prof. B. Suryanarain Rao, Founder of the Astrological Magazine). Mars rules heat and biliousness while Moon rules not only motherhood but also 'all that is watery'. The Blood formed out of the interaction of bilious Mars with watery Moon is said to cause the menses in women. According to Saravali, Chapter 8 sloka no. 2, every month when moon is transiting in anupachaya rasis (1,2,4,5,7,8,9,12 rasis) from janma lagna and is aspected by mars then the menses suitable for conception occurs in the woman. For actual conception to take place, aspect of benefic Guru on the above combination is essential as only then she would unite willingly with her husband. Also, according to chapter 4 sloka 4 of Hora Makarand by Gunakar, if sun, Moon, Venus and mars are located in their own navamsha in upachaya houses (3,6,10,11) from natal moon of a man or woman or if guru is in lagna or 5th or 9th house, the pregnancy is predicted. Similar information is obtaining in various other classics like Jatakadeshmarga, Hora sara, etc. Here, we must observe that Moon represents the female principle (Prakruthi, as Mother) and Mars represents the male principle (Purusha, as father) the union of which is paving way for procreation. It is a commonly known biological fact that in the seminal Fluid sperm is engulfed in a liquid medium which facilitates the actual fertilization of the ovum. Even the ovum contains a protective sheath within which matter is present in liquid form and only in this liquid the foetus is formed after fertilization which ultimately grows in to the child. Although the role of other panchabhutas like fire, Air, space and matter are indisputably significant in the process of procreation, it is the role of the Jala tatwa that is predominant being the facilitative medium of the whole activity. Thus, the planet Moon happens to be one of the two most important planets which rule not only the physical manifestation of the soul of man but also its very beginning in any particular birth. ii. Moon as Water, the nourishment for growth and sustenance of life : In Vedic Astrology, Moon has been epitomized as the symbol of Mother not merely as the vehicle for procreation of life but also for its multiple roles in nursing and aiding the growth of the physical form of all living things in nature. Moon, as the significator of water and other potable liquids, undoubtedly influences each and every activity of man on this earth. In mantra 89 of 4th sukta of 18th Kanda of Atharvana Veda, Moon is described with the words "chandrama Apsu antara Suparnou...". 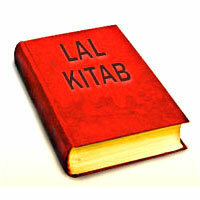 This means that the Moon is having a watery core and is the great nourisher that brings us up. Meaning : I nourish all the herbs having become the juicy Moon. (This directly alludes to the fact that Moon is watery and is the essence or juice of all plants). But, in actuality, water is essential for the whole Flora and Fauna on the Earth. In the absence of water no plant ever grows. The yield of crops depends on the quantum of water it received. If seasonal rains are good, then only the yield of crops is plenty. Any amount of reinforcements like manure, etc for increasing the yield would be a waste if the supply of water is insufficient. As, we, human beings are mainly dependent on seasonal crops and other plants for our food, unless their yield is sufficient, our day to day life itself would be at stake. That is why almost all civilizations in the past have developed around the fertile river water basins of the world, be it the Indus valley around the five rivers or the Egyptian civilization around the river Nile, and so on. Water is an inseparable ingredient of even the modern man. A life without water is unthinkable. Almost every sphere of our life is dependent on water. A thirsty man feels truly its importance more than anybody else. Of course, not merely for drinking! All the household chores like Cooking, Washing, Cleaning, etc depend entirely on water. 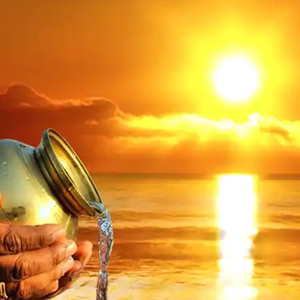 The hygiene of an individual which has a direct bearing on his health and longevity depends on the availability of enough water for all his needs. Water is essentially required in almost all industries. The works like building construction, manufacture of medicines, chemical engineering, textile dyeing, etc which cater to the daily needs of human beings cannot be done without water. In short, man would be dead without water and this earth would become lifeless. Not only that 80% of human body and two thirds of the earth are filled with water. Each plant and animal is having its own characteristic essence called as Rasa. The essence is invariably extracted only with use of water in liquid form. The best use of these rasas is well established in the Indian system of Medicine i.e., Ayurveda. The quantity of rasa depends on the amount water content in them. Thus, Moon as the significator of water is directly responsible for the birth, growth and the nourishment of all the living and non-living things on the earth. iii. Moon as the ruler of Physical manifestation, the Body : Sun is the universal soul (Atmanam Jagat) and Moon is the ruler of every physical incarnation of all human beings. We know that Consequent on impregnation, the physical body of any offspring is created and nursed fully inside the body of the Mother until its delivery to the external world. Thus, the planet Moon being the significator for mother directly rules the physical body of the native also. E.H.Bailey in his popular Book titled-"The Pre-natal Epoch" has propounded a theory which is outlined in chapter 1 (Book III) in "The manual of Astrology" by Sepharial and also dealt with by many other authors on Western Astrology in their books. (Refer "A to Z Horoscope maker and Delineator" by Llewelyn George.). According to this 'Prenatal Epoch Theory', at or near the time of conception the Moon must be posited in natal Ascendant or descendant and the Ascendant at or near the time of conception must be the Janma Rasi or the 7th Rasi from it. Accordingly, a chart for the time of conception is also prepared which is used for rectification of birth time. Sepharial, the noted author on Western Astrology, names the chart calculated for the time of conception based on prenatal epoch theory as 'The Lunar Horoscope' and writes the following words in his book titled "The influence of Sun in Horoscopes": "The Lunar Horoscope is therefore seen to hold definite astronomical relations to the horoscope of birth. It is referred to the point of time at which the Psychoplasm or astral eidolon forms a link with the physical basis of life or germ-cell." He also contends that "... the birth horoscope is that of heredity and environment. The Lunar horoscope is that of tradition and inherent faculty. To the Lunar horoscope, therefore, we must refer for the potential of the unit of life." These words clearly explain the Moon's influence on human destiny. The methodology of calculating the chart for the time of conception is based on the natal positions of Sun, Moon and Lagna. Readers interested in the actual method of calculation may refer to the sources indicated above as the subject matter of this article does not warrant any further elaboration on the concept. This reference is made here only to impress upon the fact that Moon happens to be the sole planet signifying a particular physical incarnation (birth/life) of any individual. This Prenatal epoch theory is also adopted by Prof. K.S. Krishnamurthy while devising the technique of Ruling system. The above facts establish the intimate relationship of the planet Moon with the life and destiny (physical manifestation) of any individual. iv. Moon, the Mind, as a Karmic agent: In Astrology, while Moon is the karaka for mind (chandrama manaso jatah), the body is signified by lagna. The body works due to the presence of Atma (soul) in it. But, without the co-operation of the mind, the body cannot work. It is the mind that initiates all actions and reactions. The tendencies of the mind (eg. Likes and dislikes, hunger, anger greed, satisfaction, contentment, etc, etc) are controlled by the soul's karmic influences. The ability to comprehend the external world is shrouded with the karmic veil as a result of which the mind tends to 'see what it wants to see or what its prejudice makes it to see' depending on the individual's upbringing and exposure to various aspects of life in a particular incarnation. That is why our ancestors have said : "Buddhi Karmaanusaarini" meaning that our mind works as per the dictates of our karma. The upanishadic lore is full of such allusions. They go to the extent of saying that whatever is created or understood by the mind is only an illusion while the truth is far beyond the Body-Mind intellectual frames of reference. In the physical frame of existence, all the major activities of the human body being directly related to the state of the mind, each and every activity of an individual can be controlled fully and effectively by the mind. It is the experience of hundreds of yogis of our country that the various exercises advocated in the yoga sashtra are nothing but the measures for effectively controlling the mind which ensures control over our activities. The human perception of the physical world is through the panchendriyas. It is the mind that absorbs the signals input by the panchendriyas and creates the effect of sensing (Mano-matram jagat; Mano-kalpitam jagat). Without the role of mind no sensing is possible. In the words of Sri Adi Shankaracharya - Mano maatram Idam sarvam"- meaning, everything is this world is projected by the Mind and Mind only (sloka 28 of Sadachara). Thus , identifying all names and forms and understanding them through the intellect is facilitated by Mind only without which even if the indriyas sense them their comprehension would be impossible. Thus, the mind works as an agent of karma the latter being the primary cause of the very reincarnation of the soul of the individual. Moon, as a karmic agent ensures that we reap our karmic fruits by controlling not only our perception of the world but also our response to any stimulus from it. v. Moon, the planet of Wealth : According to Jataka Parijata (Ch. 2, Sl. 49) " Sampathkara Chandrama" meaning Moon stands for abundance of wealth. As already discussed above, Moon is the ruler of the material facets of all the incarnations of the sold of a native. 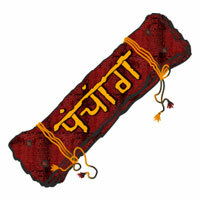 A perusal of various combinations of Yogas discussed in Astrology like Gajakesari, Sunapha, Anapha, Dhurdhura, Chandra mangala and Adhi Yogas clearly indicate that if these yogas are unafflicted in a horoscope, they are capable of conferring a high degree of wealth and other material comforts to the native when they operate. The benefic yogas like Vasumathi, Amala, Pushkala, Kusuma, Indra, Garuda, Gola, Bhaskara, Marud, etc are effective by the influence of Moon as well, apart from lagna and other planetary or Bhava influences. Generally, the yogas caused by Moon are said to be conferring wealth and material comforts while that of Sun are capable of conferring mainly Power or Authority, Status, etc to the native. Also, Sakata Yoga and Kemadruma Yogas which cause loss of wealth and abject poverty and miseries are directly linked to the placements of planets from moon. It is also worthy to note that when Moon gets hemmed between malefics or is in conjunction with or aspected by natural malefics early loss of Mother results. Here, it is relevant to point out that in the Hora Chart used for delineation of the wealth of a native only Moon and Sun are taken as the lords governing the wealth. Natural benefics when posited in Moons Hora and natural malefics when posited in Sun's Hora confer good wealth to the native. Thus, Moon undoubtedly signifies the wealth and material comforts of an individual in his material plane of existence. 3. Influence of Moon on the flora and fauna on the Earth : The physical proximity of Moon to the Earth has rendered it the most influential planet on Earth. It is a scientifically proven fact that Moon is responsible for the ebb and flow of tides. All Life on Earth has a direct correspondence with the different phases of moon. It is proved beyond doubt that the abnormal activity of lunatics is on the rise during the days near about Poornima and Amavasya. The occurrence of eclipses have a far reaching impact on almost all the global phenomena and affect the human beings in every sphere of life ranging from changes in personal environment (such as health, financial gains/losses, afflictions to family life, etc) and changes in mundane matters (such as variation in prices of commodities, changes in governments, wars between nations & so on) to the nature as a whole causing devastating earth quakes or other natural calamities like cyclones, floods, etc,. Thus, moon exercises a vicegerent control over the day to day affairs of not only the human beings on the Earth but also the whole flora and fauna on it. 4. Role of other planets in shaping human destiny : Before arriving at a conclusion on the validity of moon in timing the events, let us examine the role of other Planets in shaping human destiny. Sun, as the significator of the universal soul in its infinite form, induces life or Jeeva in to every animate or inanimate thing physically manifest in the universe. The human beings, are no exception and are necessarily under Sun's control at the subtler level. At the physical level, Sun as Arogya karaka, is responsible for the physical health of the body (Sthooa Deha). Sun works as the dormant spirit of the body (Atma Saakshi) maintaining the subtle link of universal Soul with individual Jeeva (ruled by Jupiter) and facilitates the completion of the physical activities initiated by Moon. Hence, it cannot be considered to be governing all the karmic activities of the individual in his incarnation. The planet Mars signifies physical energy, prowess, courage, etc needed for execution of the thought generated by the influence of Moon and is not a party to the decisions taken by the mind ruled by Moon. Although Mars is a constituent factor in causing the very conception of an offspring in the female, it only works in unison with Moon and not in isolation while activating the sexual impulse responsible for such procreative activity. Here also, it is moon that plays upon the mind and facilitates the fruitful completion of the activity. Thus, mars is not related to the karmic facets of physical manifestation. Mercury, signifying the Buddhi or intellect and worldly knowledge partakes in the decision taking process of the individual but seldom creates a thought. It only induces the mind either to go ahead with the activity or not rather than providing the initial pulse which is responsible for the very commencement of the activity which is provided by the Moon owing to its Karmic link. Budha rules the intelligence and knowledge gained in this life. Gaining such knowledge is only through the Mind. Budha handles the thoughts after their generation while Moon rules the Mind, the very seat of generation of thought. Hence, Moon takes precedence over Mercury. Jupiter is the planet signifying the metaphysical wisdom needed for the fruition of the karma. It signifies the individual's life force (Jeeva). Although it does not play any causative role, it deputises the universal soul in the form of Divine Grace. It either boosts or retards the activity depending on the karmic influence of the individual which we call generally as Luck or providence. 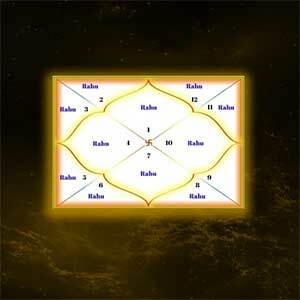 Jupiter indirectly influences the day to day activities of the individual depending on one's prarabda. It, in fact, guides the mind towards the karmic goal. As such, cannot be taken as a direct timer of events in life. Sukra, ruling the sensual comforts, is connected to the material facet of the individual's existence in as much as it activates the Pitru Rina through the realisation of Artha and Kama Purusharthas out of the chaturvida purusharthas. Its role is limited and any excess indulgence would only create Agami Karma which would work as the seed for future births of the individual. As such, it has a limited role in activating the karmic influence and hence cannot be taken as the timer of all events in one's life. Sani is the 'Pay Master' working purely for the fruition of the Prarabda karma of the individual the choice of which is made by Moon at birth. Although Sani describes the ways and means of fruition of the chosen karma, it by itself is in no way responsible for the choice made by the mind ruled by Moon. Sani, akin to the divine accountant Chitragupta, keeps an account of the quantum of karmic influence either endured or added in present incarnation. Hence, it doesnot qualify to be considered as the sole timer of events in one's life. The shadow planets Rahu and Ketu are no doubt karmic determinant being placed in the common intersection plane of the orbit of Moon and eclicptic. But, they are mathematically calculated points of sensitive energies. Their roles in everybody's life are also predetermined at birth by their cosmic link with Sun and Moon. They lack the originality and dynamism of either the Moon or any other planet. Hence, they donot qualify as timers of the whole life span of the individual although they are at times capable of inflicting lasting karmic injuries or gracing the native with superlative benefits. 5. Moon as the timer of human destiny : In the foregoing discussion we have seen that the planet moon rules the destiny of man right from the moment of conception itself. It not only Governs the very physical existence but also facilitates the fruition of man's karmic influence in any chosen incarnation/birth. It is the Moon that exercises the freewill of the discrete mind to operate one's karma while all other planets create an environment that is conducive for reaping the fruits of one's past actions during the present lifetime. Hence, to facilitate a smooth interlink of Moon with other planets, Moon is said to have No enemy among the planets. Therefore, Moon being the ruler of the physical plane of existence and responsible for creation, nourishment, length of life, material wealth, mind and decision-making and above all the fruition of karma, its role as the planet responsible for timing all the events that are to be experienced with the coordination of other planets during an individuals lifetime is undoubtedly valid. The division of Zodiac in to 27 Stars or Lunar Mansions, the concept of Janma Nakshatra, the sequence of Dasa/Bukthi and the technique of interpreting the influence of transits of planets provide the foundation for interpreting the roles of other planets in the destiny of the native. The natal Moon position signifying the beginning point of the present manifestation is rightly taken as the basis for defining the starting point of nakshatra based dasa systems in vedic Astrology. Finally, the fact that Moon itself forms the basis for understanding the very concept of time right from times immemorial and the extensive use of Lunar calendar by a vast majority of the people of this country adds to the validity of Moon as the timer of events in one's life. 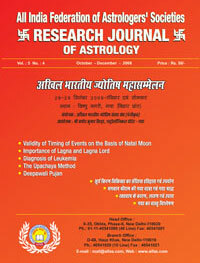 In this Prediction Techniques Issue of Research Journal of astrology there are various informative and research oriented articles related to prediction technique like - Cancer, diagnosis of Leukemia, The Upchaya Method, the Importance of lagna and lagna Lord, Validity of timing of events on the basis of natal moon, Navamsha, health and wealth: Mantra of vastu, Foreign travel yoga, Prediction from Suryashtak varga, Numerology and Health, Reasons, Symptoms and Remedies of Blood Pressure, Sun Ray Therapy, eyes and astrology, Gaya journey and gaya Shraadh by Lord Rama, Good Health, Diabetes: Numeropalmistry, and significance of Colors : An Astrological Analysis.